The revolution in agriculture had three results which went far beyond the limits of agriculture itself. First it increased the productivity of the land and so made possible the feeding of the great industrial population in the new towns. Second, it created a reserve army of wage earners, now "freed" completely from any connection with the soil, men without ties of place or property. It provided a force of free labourers corresponding to the free capital that had accumulated, and it was the coming together of this labour and this capital, at a time when the large scale production of commodities was at last possible, which was the essence of the Industrial Revolution. Third, there was the creation of a vastly increased internal market for manufactured goods. The subsistence farmer, with his domestic industry and his isolation from the outside world, might consume a good deal and yet buy very little. The labourer into whom he had now evolved was usually compelled to consume a great deal less, but everything he consumed had to be bought. And it was only on the firm basis of a substantial home market that a great exporting industry could be built up. Early in the eighteenth century England was faced with the prospect of a fuel famine. For centuries the great forests had been invaded, trees felled and land brought under the plough. Little had been done in the way of replacement. Wood for domestic use began to be scarce and dear while the iron industry was threatened with extinction. All smelting was done with charcoal, and so primitive were the methods employed that many tons of wood were needed to produce one ton of iron. The timber of the Sussex Weald gave out first. That of Shropshire and the Forest of Dean, to which the industry migrated, was already showing signs of exhaustion. Ireland was soon stripped bare. Strenuous and repeated efforts were made to establish iron smelting on a large scale in New England, but here the Navigation Laws proved an obstacle to industrial development. In England itself the production of iron fell year by year and the country became increasingly dependent for its supplies upon Sweden and Russia. Meanwhile experiments were being made with another possible fuel, coal. From quite early in the Middle Ages coal had been used for domestic purposes and even in some industries, but it was only mined in quantity around Newcastle, where seams lay close to the surface and where easy transport was available by water. Large quantities of this Tyneside "sea-coal" were shipped to London. Attempts had been made to use coal for smelting iron even before the Civil War, but it was not till the middle of the eighteenth century, when the fuel situation was becoming really desperate, that smelting with coal was established as a commercial possibility. The Darbys of Coalbrookdale and Roebuck, who established his famous works at Carron in 1760, made a series of improvements which showed not only that it was practical to use coal for smelting iron, but that with a blast sufficiently powerful to get rid of sulphur and other impurities it was a far more economical and effective form of fuel than charcoal. In 1765 the iron industry found a new centre at Merthyr, and henceforward the number and size of the blast furnaces increased yearly. The production of pig iron, which was only 17,350 tons in 1740, had risen to 68, 300 tons in 1788 and to 125,079 tons in 1796. Without coal there could have been no modern, scientific metallurgy and modern metallurgy is the technical key to large scale industry. Without it the construction of the elaborate and delicate machinery needed by the textile industry would have been as impossible as that of steam engines strong and exact enough to serve as a source of industrial power. Iron was soon put to a variety of new uses: the first iron bridge was built over the Severn in 1779 and the first iron ship in 1790. Improvements in the quality and purity of the iron went hand in hand with increasing accuracy in tool making, and engineers began to work not to inches but to the minute fractions of an inch, which made it possible for elaborate machinery to be constructed to a pattern and with interchangeable parts instead of empirically. With the exception of some of its lighter branches such as nail making, the iron industry had never been organised on a domestic basis. The iron masters of Sussex and the Midlands had been substantial men working with a large capital; it was therefore possible for the industry to make rapid progress without much structural alteration. By the end of the century England was a considerable exporting country and had even begun to import high quality ore from Sweden and Spain to be smelted with coal mined at home. It was for this reason that the industry took so firm a root, for example along the coast of South Wales. Coal mining also developed rapidly. New coalfields were opened up in South Wales, Scotland, Lancashire and Yorkshire, and output increased from 2,600,000 tons in 1700 to 7,600,000 tons in 1790 and over 10,000,000 tons in 1795. This industry, too, was always capitalist and many peers and great landowners were also coal owners. The Duke of Bridgewater, for example, famous as a builder of canals, was also noted for the truck system by which he robbed the Worsley miners of a large part of their wages, while the Lonsdale and Londonderry families shared the eighteenth century habit of regarding their colliers as a kind of serf. Yet coal had one serious drawback as compared with wood: while the latter was fairly evenly distributed throughout the country, coal deposits were concentrated in a few counties. This disadvantage was only partly counterbalanced by the fact that in a number of places, such as South Wales and the Midlands, deposits of coal and iron were found side by side. Consequently coal could never be an effective substitute for wood so long as internal communications remained in the primitive state in which they were at the beginning of the eighteenth century. It was mining of coal and the beginnings of the heavy industry which gave the first impulse to the improvement of transport and above all to the construction of canals. In 1700 few roads existed along which wheeled traffic was possible at all times of the year. Lighter goods were carried in panniers slung over the backs of horses, but for any bulky articles the cost of such transport was prohibitive. The carriage of coal from Manchester to Liverpool cost 40s. a ton. Even when better roads had been built between some of the important centres land transport remained costly. The Duke of Bridgewater in 1759 employed Brindley to cut an eleven mile canal between his Worsley collieries and Manchester. This was so successful that when it was completed the price of coal in Manchester fell by exactly one half. Two years later the canal was extended to Runcorn, linking Manchester to the sea. The next venture was to connect this canal with the Trent and the Potteries, which needed heavy material such as clay from Devon and Cornwall and flints from East Anglia, and whose products were at once too bulky and too fragile to be suitable for carriage by road. When the Grand Trunk Canal was finished the cost of transport was cut to one quarter, and both the pottery industry and the working of the Cheshire salt deposits increased enormously. Very soon a regular fever of canal building, comparable to the great railway boom of the nineteenth century, swept over the country, which was quickly covered with a network of waterways. In four years alone (1790-1794) no fewer than eighty-one Acts for the construction of canals were obtained. The whole interior of England, hitherto forced to consume and produce the great bulk of its own necessities, was now laid open to commerce. The wheat, coal, pottery, and iron goods of the Midlands found a ready way to the sea, and coal in particular could now be carried easily to any part of the country. Even though a general improvement in the roads was effected at the end of the eighteenth century and the beginning of the nineteenth, canals remained the principal means for the distribution of heavy and non-perishable goods till they were deliberately destroyed by the railway companies forty or fifty years later. Little improvement was made in the roads so long as they were kept in repair by occasional forced labour of the villages through which they passed, labour organised in a haphazard way by parish overseers. Early in the eighteenth century this system was supplemented by the erection of toll gates along the main roads: in this way the upkeep of the roads was paid for by the traffic passing along them. After the Jacobite rising of 1745 some roads were constructed for military purposes but the development was still very uneven. In some places where efficient turnpike trusts existed a road would be good. A few miles farther on, if the trust was corrupt and inefficient, as was not unusual in this period, the road would be correspondingly bad. Farther on again it mightstill be maintained by parish labour and be almost impassable. The minor roads and by-roads had scarcely altered at all since the Middle Ages. It was not till the early years of the nineteenth century, in the age of the stage coach and the scientific road engineering begun by Macadam, that there was a general improvement. Shortly after, the development of the roads, like that of the canals, was checked by the advent of the railway, and little more was done till the motor came into general use. Bad as roads were about 1800 by the standards of today, they had improved greatly in the preceding century, and, though canals were more important for the carriage of goods, the speed and ease with which communication could now be maintained between all parts of Great Britain, and the regular postal system which was established, proved a great stimulus to the progress of industry by bringing manufacturers more closely into touch with their markets. In the fifteenth and sixteenth centuries the wool industry developed to a semi-capitalist stage, with the clothier acting as a virtual employer of the handworker. This development was, however, arrested in the later part of the sixteenth century. The absence of machinery, the restricted market and the insufficient -accumulation of capital combined to prevent the growth of a real factory system and of mass production methods. From the sixteenth to the eighteenth century the industry remained in a state of suspension, growing in extent but not altering radically in structure and organisation. It was not in the wool industry, but in the newer, more concentrated, and, from the beginning, more capitalist cotton industry that the decisive advances were made. It was established only with difficulty and after a long struggle with the powerful wool interests which saw in it a dangerous rival. Fine cotton goods were imported from India and became very popular till an Act of Parliament forbade their import in 1700. This gave an impetus to the manufacture of substitutes at home, though it was a long time before cotton yarncould be made sufficiently strong to be woven without a warp of linen or wool. At first the new industry was considerably hampered by restrictions insisted upon by the jealous wool manufacturers, but the cheapness, lightness and novelty of the cotton cloths gave them a ready sale. It was just because the new industry was artificially planted, depended on a raw material imported from abroad, and was forced to be adaptable and ready to adopt new methods to defeat attacks and to overcome technical difficulties that it developed on a capitalist basis and was the first to profit by the inventions of the late eighteenth century. It was from the start centred in Lancashire where there was wool needed for the warp and a damp climate which proved suitable for spinning cotton yarn. Like all textile industries it was sharply divided into two main sections, spinning and weaving. The latter was the better paid and the more prosperous. Spinning was a slow and labourious process and it had always been difficult for the spinners to supply the weavers with sufficient yarn to work upon. Kay's flying shuttle, by doubling the speed at which cloth could be woven, completely upset the balance between the two sections, creating a chronic shortage of yarn and an urgent necessity for an improved method of spinning. 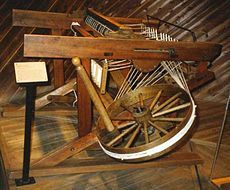 In 1764 a Blackburn weaver named Hargreaves produced his spinning jenny. A few years later Arkwright invented the water frame, which not only spun cotton more rapidly but produced a yarn of finer quality so that cotton fabrics could be made without an admixture of wool or linen. Crompton's mule combined the advantages of both these machines. At about the same time Whitney's cotton gin simplified the extraction of workable cotton from the plant and so increased the supply of raw material, and there was an immense increase in plantation slavery in the cotton States of the U.S.A. The balance between weaving and spinning was thus again destroyed, this time in favour of spinning. Henceforward, a continuous series of technical advances in each section of the cotton industry stimulated progress in the others. Cartwright's power loom enabled the weaver once more to outpace the spinner, while other typical inventions concerned wool-combing and the printing of calicoes. Unlike the flying shuttle and the spinning jenny, which were only improved forms of the hand loom and the spinning wheel, Arkwright's water frame and the machines that followed it required external power, supplied at first by water. This necessarily placed them beyond the reach of the domestic workers and led at once to the creation of factories where masses, at first of spinners and afterwards of weavers as well, were collected ta work for wages paid by employers who not only owned the material that was being worked up but also the instruments that were used and the place where the work was done. By 1788 there were 143 such water mills, and the abundant water power in Lancashire led to a further concentration there of industry and population. 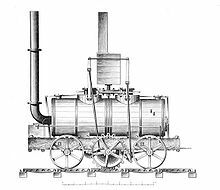 In 1785 the steam engine was first used to drive spinning machinery, and it soon drove out of favour the less manageable and less dependable water power. The discovery of large coal deposits kept the industry still in Lancashire, and by the end of the century the cotton capitalists were "steam mill mad". A witness before the Factory Commission of 1833 describes the varied recruits drawn into these factories: "A good many from the agricultural parts; a many from Wales; a many from Ireland and from Scotland. People left other occupations and came to spinning for the sake of the high wages. I recollect shoemakers leaving their employ and learning to spin; I recollect tailors; I recollect colliers; but a great many more husbandmen left their employ to learn to spin; very few weavers at that time left their employ to learn to spin, but as the weavers could put their children into mills at an earlier age than they could to the looms, they threw them into the mills as soon as possible." The main sources of recruitment appear very clearly: the factory system was based upon child labour, the labour of handicraftsmen who were losing their occupations, of the Irish reduced to starvation level by English rule, and above all upon the labour of the new rural proletariat fleeing from the vast distressed area into which enclosures had turned a great part of England. Until about 1790 machine production was confined almost entirely to the cotton industry and to Lancashire. Its effects were therefore limited to a small section of the population and it provided employment for many more people than it displaced. When machinery began to be applied to wool textiles hardly a single county was not affected. And since the impact, came at the very height of the enclosures, when the country-workers had already been deprived of many of their accustomed sources of income, the effect was disastrous. Prices were rising much faster than wages just when thousands found themselves forced as they had never been before to rely entirely upon these wages. Hand spinners and weavers either found themselves deprived of their occupation or driven into a hopeless contest with the machine, which led to untold misery prolonged through more than a generation before domestic industry finally went under. Meanwhile, over the country as a whole, population was increasing rapidly in spite of the general distress and the reckless wastage of life in the factories. In 1801, at the date of the first Census, it was nearly 9,000,000; in 1811 over 10,000,000; and in 1821 12,000,000. Density per square mile probably at least doubled between 1721 and 1821. There was also an immense change in the distribution of the population over the country; and towns grew fast, especially in the new industrial areas, as factories increased in size and number. The relative population and importance of Southern England, including the old centres of the woollen industry as well as the agricultural districts, sharply declined. The peculiar misery of the time, due to the revolution in industrial and agricultural production, with its accompaniments of increasing population and high prices, was accentuated by two external factors. First, the years from 1789 to 1802 produced a remarkable and almost uninterrupted series of bad harvests due to weather conditions. And, second, the central period of the Industrial Revolution - 1793 to 1815 - was occupied by European wars on a scale never before known. It would hardly be too much to say that Britain entered these wars an agricultural and emerged from them an industrial country.